Wendy Caldwell Maloney is a native Buffalonian whose training began with a broad foundation of studio art and ceramics at The Park School of Buffalo and continued at Alfred University where she earned her BFA in Art & Design with concentrations in drawing, printmaking and photography. She returned to Buffalo in 1979 and began a career in the pre-press industry working as a typographer and graphic artist. In 1991, she began her own graphic design and illustration business, Current Design. As a sole proprietor, she served the Western New York business community for two decades in a wide variety of roles, from concept and design, to typesetting, illustration, copywriting, and print brokering. By 2002, a yearning to return to the fine arts led Wendy to study watercolor with renowned Buffalo artist Margaret M. Martin. She took to the medium instantly, finding it endlessly versatile and challenging and within a year was showing and selling her work in Western New York and New England with considerable success. 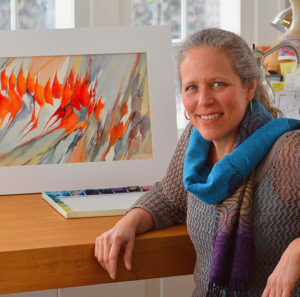 Inspired most often by the rich textures, vibrant colors, and exciting line qualities of the natural world, her work ranges from organic and botanical images to the rugged features of the eastern seacoast. Abstract works are often inspired by her innate love of color and her instinctive response to music and dance. Wendy has exhibited in a wide variety of solo, two-person, and group shows. Venues include: the Albright-Knox Art Gallery, The Kenan Center, Western New York Artist’s Group Gallery, Buffalo Big Print Gallery, Fox Run’s Gyda Higgins Gallery, Hallwalls, The Jewish Community Center, Hospice Buffalo, The Buffalo History Museum, The Saturn Club, and The Birge Mansion, as well as the Buffalo Decorator’s Show House. She is included in the Collections of Roswell Park Cancer Institute, Oishei Children’s Hospital, Harmac Medical Products (Mexico) and the Gerald Mead Collection. She is an exhibiting member of the Buffalo Society of Artists, has taught workshops at The Burchfield Penney Art Center, and works from her home studio in Snyder, NY.